grow callus tissue over any borers that attack the tree. A healthy tree can stop a borer from getting too far, but a stressed tree will not be able to keep up with the borers, and the borers will eventually girdle the portion of the tree that they’re attacking. The tree at right, shows bark stripped off the tree to show some of the galleries created by larvae. Larvae take 1 or 2 years to develop depending on tree health and how far north they are. Adults are present for most of the summer, although each adult only lives about a month. 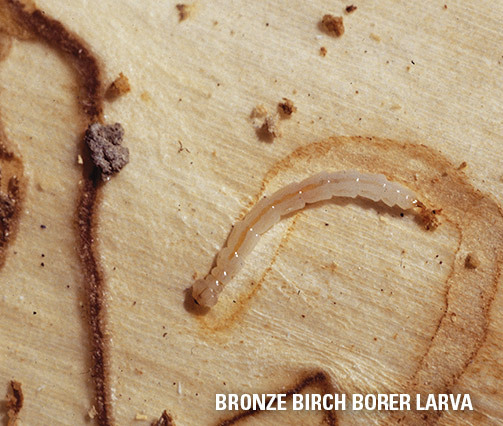 Bronze birch borers live through the winter as larvae under the bark of trees in pupal chambers. They transform into pupae in spring. Start to emerge as adults in early June. They can keep emerging until July. The adults live for two to five weeks, feeding on leaves, mating and laying eggs in branch or bark crevices. 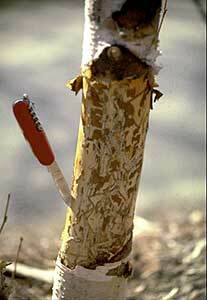 The eggs hatch and small larvae chew through the bark to gather nutrition. While feeding, the larvae create galleries that become packed with their frass. Frass is a mixture of borer feces and sawdust. Most larvae consume enough tissue through summer and fall to complete their life cycle in one season. In very cold climates, or where the larval resources are limiting in the tree, it may take two years to complete a generation. 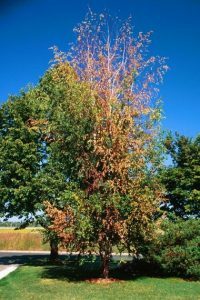 Adult beetles feeding on the leaves of trees do not affect tree health. Galleries created by larvae disrupt the transport of water and nutrients in infested trees. The first symptom is branch dieback at the top of the tree. If the tree continues to decline, dieback extends down into major branches and eventually into the main stem. Bronze birch borer galleries look like ridges of raised, bumpy callus tissue on the bark of infested birch. 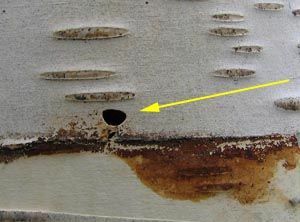 ⅛ inch D-shaped exit holes might be seen on trunks and branches. On paper birch, you may see ridges but no exit holes. Trees that are stressed from drought or defoliation may suffer more damage due to feeding by borers. Stress affects the ability of a tree to acquire and distribute water and carbohydrates throughout their canopy. construction practices like re-grading the landscape, installing new landscape components or by damaging roots when building or expanding homes. Insecticides can be used for controlling bronze birch borer in yard trees. In forested areas, keeping the birch healthy (and not too old) is a key to reducing the amount of bronze birch borer attack.